Here's another fantastic recipe I nabbed from The Caked Crusader! 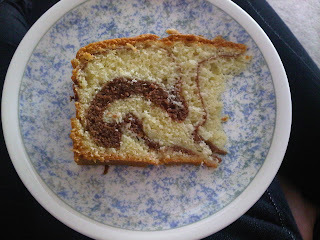 I was so proud of myself for making not only such an appealing cake but also one that tasted so unexpectedly delicious. According to The Caked Crusader (my new go to for recipes), this is a traditional Polish cake with each family taking on their own version. 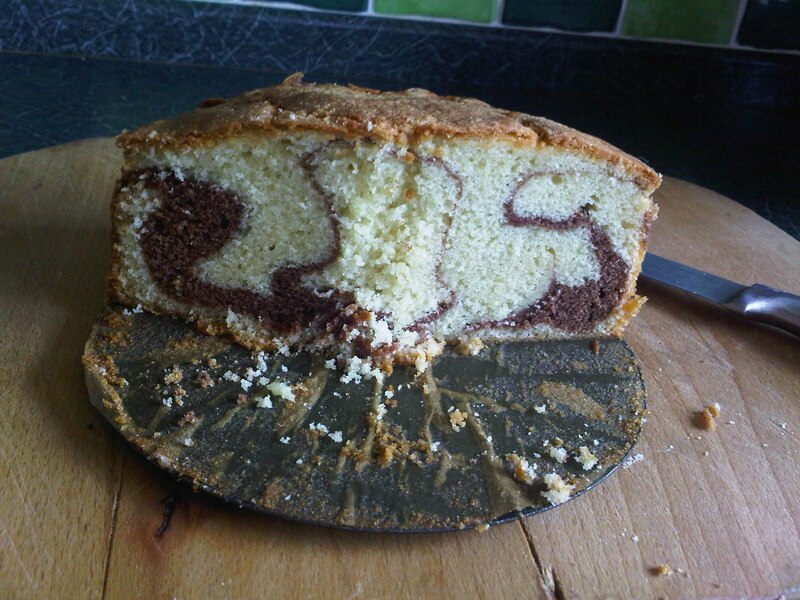 Wikipedia also tells us that it is a sweet yeast cake, but this recipe has no yeast in it. 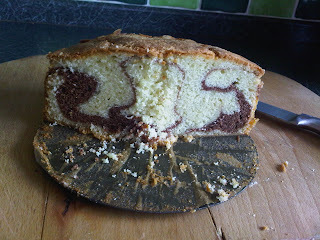 Although my cake did not have a consistent strip of chocolate through it's middle as I expected from the pictures the CC gives, it did have the most beautiful swirls and each slice concealed it's own little pattern! I'm curious to see whether I could substitute real chocolate for the cocoa powder, to give a greater depth of both colour and flavour. I'd also like to try this with my Strawberry Yoghurt Cupcake recipe, I don't see why several sponge mixtures can't be layered in this way! Heat the oven to 160°C/fan oven 140°C/315°F/Gas mark 2-3. Line an 18cm loose bottomed tin with baking paper. 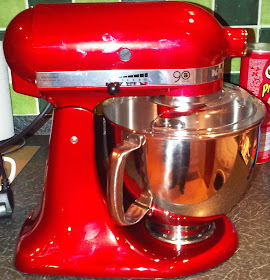 Start by beating together the butter and sugar until light and fluffy. Slowly beat in the eggs and 2 dessertspoons of cream. Fold in the flour. If the mix feels too dry add 2 more dessertspoons of cream. Spoon 1/3 of the cake batter into the prepared tin and level the surface. Put to one side. Spoon half of the remaining cake mix into a dish. Put to one side. Add the cocoa to the half left in the bowl and stir gently until the batter is a nice even brown. Spoon the cocoa batter into the tin and level the surface. Spoon the remaining plain batter into the tin and level the surface. Bake in the over for approximately 1 hour or until a skewer comes out cleanly. Mine took 1 hour 5 minutes. Leave to cool completely in the tin, on a wire rack. I love this, I keep wanting to try marbling! Try it, it's so so simple! Also, Google zebra cake, looks amazing!